A major goal of Slavery by Another Name is to introduce the little-known story of forced labor to the widest possible audience, first through a powerful documentary and then through a rich variety of “beyond broadcast” elements and activities. Slavery by Another Name in the Classroom aims to not only educate, but also to recover, explore and document shared histories. To delve into the breadth of history surrounding forced labor, the educational materials are aimed at high school and college settings and are divided into units on History, Civics and Social Justice, English and Media Literacy, and Economics. Each unit features activity guides that are designed to provide flexibility for use in the classroom and include a variety of rich multimedia film and oral history clips. To help you begin using the classroom materials. We have provided the following resources to help you get started. Documentaries can be powerful tools for enhancing understanding and generating dialogue. 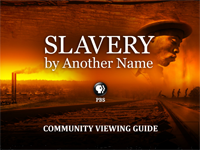 To extend informal education and discussion aboutSlavery by Another Name in the community for years to come, we’ve developed a Community Viewing Guide. The guide aims to arm civic organizations, workplace-based groups, educational institutions, families and communities with ideas and questions to prompt deeper discussion of the film, the history that it covers, and the contemporary social justice and racial equity issues that it raises. This guide also offers guidelines for planning and promoting a screening, event or panel discussion. The ultimate goal is to encourage communities to come together, explore this history, uncover and share their own, and move positively into the future.